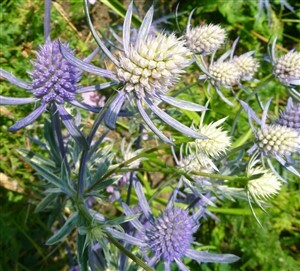 Eryngium 'Jade Frost' (Variegated Sea Holly) (2'). A new and still rarely seen plant with grey green leaves edged with cream and in spring especially, pink. These are unique and very attractive. The mid summer flowers open cream and age intense blue. Steadily clumps up to produce an eyecatching border feature. For sun, not waterlogged soil. Hardy came through winter of 2009 unscathed. Photos of flowers the variegated leaves can hardly be seen.